Twice in the last month you've identified cars involved and hit-and-runs, including a quick I.D. that was "critical" to solving a case. Now a pedestrian in Chicago's Ukranian Village been struck and killed by a hit-and-run driver sometime around 2:30 AM on Wednesday. Police have a surveillance camera image of what they believe is the car. Now they need your help identifying it. Please look at the photo above and see if you can't help narrow down what vehicle it is. We spoke with Chicago Police this afternoon and said they aren't sure of the make/model/year. Provide your theory and the best answers in the comments and we'll let them know what you've come up with. 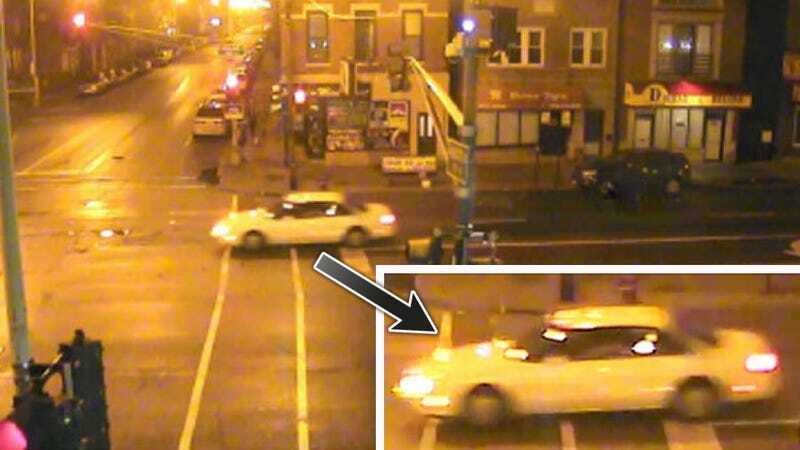 And if you're in Chicago and you happen to know this specific vehicle used in the crime please leave a message in the comments or call investigators at (312) 745-4521. As always, do not attempt to apprehend anyone. Leave that to the authorities. UPDATE: This is a tough challenge. Below are the best guesses so far.